The Spanish region of Extremadura, borded to the east by Castilla La Manch and to the west by Portugal, is one of the most beautiful and least visited regions of Spain though it is probably better known to bird watchers. Being relatively unknown to most people (tourists), Extremadura region is surprising large, it's two provinces being the largest in Spain. Extremadura has several Natural Parks, particularly in the valleys of the two main rivers, the Tajo and the Guadiana. 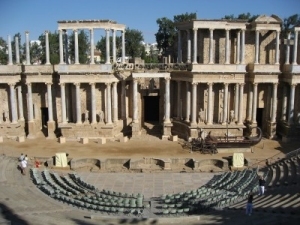 Extremadura also has a number of impressive roman cities, Mérida having been one of the most imoprtant cites in the Roman Empire. Notable gastronomy includes: Trout, Game, Sausages, Cheese and excellent wines. The topography of Caceres province (the second largest province in Spain) is dominated by the Sierra de Gredos to the North West, the Sierra de Guadalupe to the South West, and the valley and plains of the river Tajo which flows westwards across the centre of Caceres, through Portugal, to meet the sea at Lisbon. Part of the River Tajo valley forms the Monfrague National Park - a bird watchers paradise. The city of Caceres has Roman origins and the old part is ringed by a moorish city wall with towers. 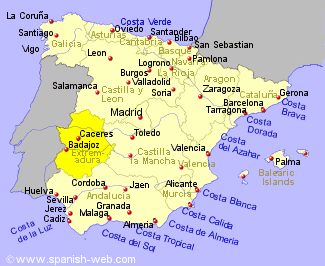 The southern of the two provinces of Extremadura, and bordering with western Andalucia, this is the largest province in Spain, and has one of the lowest population densities. The countryside here is gently undulating with only low hills, in contrast to much of Spain. Although there is a considerable amount of ceareal production in this province, there is also a large amount of rolling rough grassland or steppe, wetlands, and open forest, all of which help make this a haven for birds, and bird watchers. The provincial capital city, also named Badajoz, is situated on the banks of the river Guadiana, close to the border with Portugal.